Is a problem with excessive armpit sweat demolishing your wardrobe and your self-esteem? Have you tried every deodorant on the market, hoping that the next one will somehow work better, but it doesn’t? Excessive armpit sweat can make normal social experiences unnecessarily painful. From the hot date that wasn’t to the important job interview you could have aced. This sticky problem will keep ruining what could have been great moments until you manage to kick it to the kerb. It’s doesn’t just take its toll mentally. Excessive armpit sweat can be a wardrobe nightmare. It’s a highly expensive problem as some sweat stains are impossible to remove without dry cleaning. I’ve done some research to try and find a way to stop armpit sweat in its tracks. Read on to learn more. The scientific term for excessive armpit sweating is axillary hyperhidrosis. From a dermatologist’s perspective, sweating is considered a medical problem when it causes emotional or physical distress and interferes with your social life. For most people, excessive armpit sweating is often entirely situational. It usually only arises in cases of high stress, such as a public speaking engagement. However, if you are experiencing heavy sweating constantly – especially in one or two areas of the body – it might be hyperhidrosis. Sweat and odor accumulate in your armpit region because this is where the apocrine glands are located. The apocrine glands secrete a protein and fatty acid substance that makes armpit sweat thicker and yellowish in color, which is why you see yellowish-stains on your clothes. The International Hyperhidrosis Society publishes new findings on various sweating disorders (such as palmar hyperhidrosis – excessive palm-of-the-hand sweating), and often does clinical trials. Many of these trials have led to the discovery of some of the treatments I will be discussing with you today. When pinning down the best treatment for your particular situation, dermatologists advise starting with over-the-counter antiperspirants before moving to stronger prescription products or more expensive approaches like Botox. Antiperspirants are what you want to combat excessive sweating, not deodorants, though you can use both. This is because deodorants are designed to fight odor, not sweat, and you need to address the sweat issue before there is any hope of removing the odor. Nowadays, we know more about stopping excessive armpit sweat than ever before. I hope you’ll find something among the list of products and treatments below that will work for you. You probably think you know how to use your antiperspirant or deodorant, right? There are a few tips and tricks that can make them much more effective. Surprisingly, most people apply these products in completely the wrong way, meaning results can be disappointing. Most people jump out of the shower in the morning, towel off, and then apply deodorant or antiperspirant before they dress for work. This is actually the least effective way to stay dry and odor-free throughout the day. When you apply any antiperspirant or deodorant in the morning, the sweat glands are really active and wash away deodorant molecules before they are absorbed. Instead, apply your antiperspirant at night, after a really good shower to remove all the bacteria from your skin. Also, before the shower, you want to pat–not rub—the underarm dry. Why? Because any fibers or lint that block those glands will also prevent your sweat glands from absorbing crucial ingredients like aluminum. Antiperspirants use aluminum molecules to block sweat ducts, and it takes time for the ducts to absorb these molecules completely. Nighttime is when most people with axillary hyperhidrosis sweat the least and move least as well. This allows your pores to really absorb the aluminum. Believe it or not, applying antiperspirant the night before, can halt sweating for up to two days. If you want to feel even fresher in the morning, you can still shower and it won’t wash away. As I mentioned earlier, aluminum compounds in antiperspirants block pores where sweat is released. As they are sucked into the pores, the spray or solid fills the area like a sealant, preventing sweat from being released. Since it is the aluminum that blocks the sweat, you can tell how strong an antiperspirant is by the percentage of aluminum compounds in the ingredient list. Prescription-grade antiperspirants tend to contain the most aluminum hydrochloride, but today, there are all kinds of over-the-counter antiperspirants that are just as effective against axillary hyperhidrosis. Let’s look at some of them. There are so many options on the market now for masking odor and stopping sweat – it can be overwhelming. When you suffer from excessive armpit sweat, the decision comes down to more than just choosing the product with your favourite fragrance. As I said before, for more severe cases, skip deodorants altogether and turn straight to the ingredient list. All of the products I’ve chosen here have a high aluminum content so the odds are stacked in your favour. If they’re not a good fit for you – don’t give up. Don’t be afraid to ask your pharmacist for a recommendation. He or she probably sees hundreds of people a year with the same issue so there’s no need to be embarrassed. Secret Clinical Strength Smooth Solid contains 20% aluminum zirconium trichlorohydrex glycine – the strongest concentration you can buy over-the-counter. Secret Clinical Strength is the go-to brand for women (and some men as well) who suffer from excessive armpit sweating. The solid is creamy, and goes on easily and is available in several different scents. There’s even a hypoallergenic version. Reviewers rave about its softness and claim that it lasts for days, not hours. Obadan Antiperspirant Spray is touted by all its users as the best over-the-counter antiperspirant for hyperhidrosis sufferers and a social lifesaver. Containing 20% aluminum chloride, this product promises to be quite strong indeed. In fact, consumers warn you to apply this very sparingly with a cotton ball and not to shave your underarms the night you apply it. It can irritate the skin when not used carefully. Although it is slightly more expensive than some antiperspirants, it comes with a guarantee so could be well worth the investment. Gel deodorants can often go on too wet and leave you with a sticky feeling, however this product claims to be different. Users say that it goes on dry and smooth, offering a full day or more of strong protection. Affordably priced, this products is touted by its followers as providing the best all-day protection for men – even during heavy workouts! Users say that Gillette Clinical Endurance Clear Gel doesn’t irritate their skin, either — even those who have experienced skin irritation from other products. If you thought Botox was just for making wrinkles disappear, think again. Botox has proven highly effective in the treatment of axillary hyperhidrosis.The technique is much the same – Botulinum toxin type A is injected just under the surface of the skin. Yes, the botox protein is the same substance involved in the illness botulism, but in small, controlled doses, it can be useful. The botox protein blocks the nerves that supply the eccrine glands, cutting off the chemical messenger that makes us sweat. What is great about Botox is that it reduces sweating in the armpits by as much as 82 to 87%. Results begin to surface in as little to two to four days after the injection procedure. Plus, the effect can last four to twelve months, with some patients finding that it lasts as long as fourteen months! Although injections usually cost somewhere around $1,000 for two arms, most users say it is well worth it. Can you really put a price on the confidence and security of finally being completely free of excessive armpit sweating? You should also factor in the time and money you’ll save by doing less laundry and no longer needing to replace clothes destroyed by sweat. Miradry is a treatment for those suffering from excessive under armpit sweating. Miradry uses a handheld device to deliver electromagnetic pulses beneath your skin to the specific areas where sweat glands are located. Miradry uses heat to gradually decompose the sweat glands while cooling off the skin at its surface. Most patients only need one treatment to be free from sweat forever, but more resistant armpits may require extra treatments.The most painful part of this procedure, is the shots used to treat the area with lidocaine. After that, it’s plain sailing. Miradry is not exactly cheap. 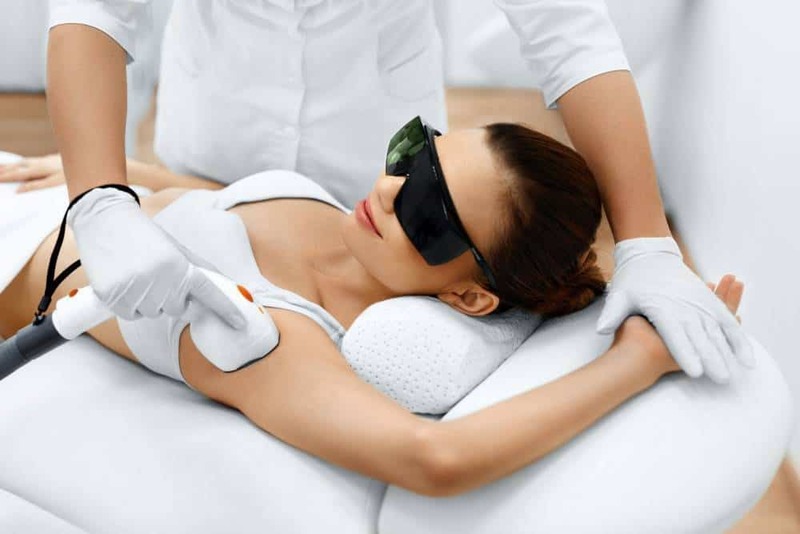 A complete session of treatments runs from $2,500 to $3,000 dollars. However, it does promise a lifetime without the hassle of constant armpit sweat and for those with severe hypohydrosis. Depending on your experience, you might decide that it’s worth the high price tag. How Much is Complete Dryness Worth to You? All of these new antiperspirants and treatments offer hope for a way to stop armpit sweat once and for all. You must ultimately decide is if it’s better for you to spend a little every month over the course of your lifetime, or to make a larger, once-off investment now to get rid of the problem forever. Perhaps you can try the less expensive antiperspirants we recommended above while you save up for a procedure like MiraDry, which can save you from armpit sweat embarrassment your entire life. Either way, the recommendations above should have you living a more carefree, enjoyable life – with a much more elegant wardrobe – in no time. How To Stop Facial Sweating?